Belk and the Gwinnett Braves have announced the renewal of their community-based partnership called Belk Education Days at Coolray Field. This season marks the fourth year the team has designated three weekday games as field trip opportunities for Gwinnett County students and teachers. Educational activities will be incorporated into each game in order to enhance the overall baseball experience for students. 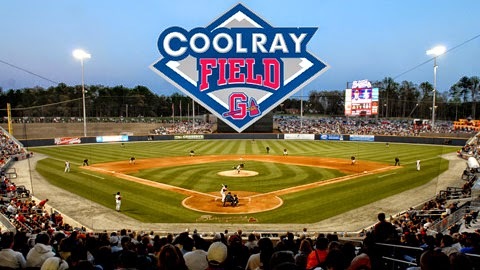 Schools can select from three Gwinnett Braves home games during the 2014 season: Thursday, May 8 vs. the Buffalo Bisons, Monday, June 23 vs. the Louisville Bats and Thursday, July 24 vs. the Scranton Wilkes-Barre Red Barons. The first pitch for the May 8 game is scheduled for 10:35 a.m. and the first pitch for the June 23 and July 24 games is scheduled for 12:05 p.m. Tickets are $5 per person for all participating groups, and seats are available on a first-come, first-serve basis. Optional $5 meal packages are available upon request. The 2014 Belk Education Day games will feature interactive plaza stations provided by community partners and a Math and Science Activity Zone to give students a fun and engaging educational experience. The Activity Guide for Teachers offers a wide range of original activities and examples that follow the instruction of Georgia Performance Standards (GPS). Approximately 12,000 Gwinnett County students and educators are expected to participate in the 2014 Belk Education Days series at Coolray Field.